In recent months, we spent a lot of time and effort to design and implement a well-functioning open-source collaborative search system called SearchX. I wrote about it here. Having done all the implementation work, now is the time to reap the benefits of the work, i.e. run experiments with our new and shiny research tool. The field of Search as Learning addresses questions surrounding human learning during the search process. Existing research has largely focused on observing how users with learning-oriented information needs behave and interact with search engines. What is not yet quantified is the extent to which search is a viable learning activity (and alternative) compared to instructor-designed learning. Can a search session be as effective as a lecture video — our instructor-designed learning artefact — for learning? Across all five conditions, every participant (we had 151 in total and ended up using workers from the Prolific platform as CrowdFlower workers turned out to be too unreliable) first conducted a pre-test for which randomly three of the ten available topics (such as radioactive decay, urban water cycle, glycolysis) were selected. We asked our participants for each of the topics to assess their knowledge on ten vocabulary items (these items were all domain terminology, e.g. Auger electron, coagulation, krebs cycle) and assigned the participants to the topic they knew the least about. After the participants completed their condition, we evaluated their knowledge on those vocabulary items again. Collaborative Search (CSE): two participants search together using the collaborative version of SearchX for at least 20 minutes. This variant of SearchX (since this is a modular implementation we can easily switch interface features on and off) included the shared query history widget, shared bookmarking and a chat window. The median time our participants spent in the experiment was 49 minutes; we paid out £5.00 per hour. I don’t remember having seen this term/phrase before. I have seen this term/phrase before, but I don’t think I know what it means. These levels do not only provide us with information on how certain our participants are about their learning (state (3) vs. (4)) but also required participants to write down their idea of the definition of each term, which we then could manually check. 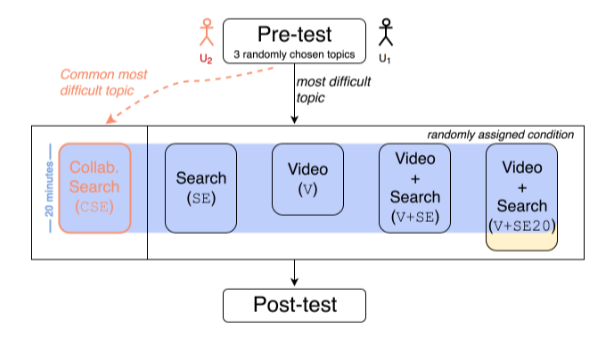 lecture video watching supported by search leads up to a 41% improvement in learning gains over instructor-designed learning without a subsequent search phase. Here, 1/2 → 4 indicates the fraction of vocabulary state changes between the pre- and post-test that went from (almost) no knowledge to knowing the term/phrase; 1/2 → remaining indicates no changes in knowledge state between the pre- and post-test and so on. Across all conditions, participants in SE have the largest percentage (>40%) of vocabulary items that remain unkown to them (knowledge levels 1/2). As expected in the V (+SE/SE20) conditions this percentage is considerably lower (15%-20%) as all tested vocabulary items were mentioned in the video (that’s a result of us defining the vocabulary terms). Collaborative search (CSE) did not help at all, two participants searching together gained the least knowledge; quite a deviation from our expectations. Interestingly, despite achieving the least, the collaborative search participants were the ones that self-reported the least problems in their learning! So far, we have restricted ourselves to the vocabulary learning task—an open question is whether the findings are robust across a number of cognitive skill levels. With increased cognitive skill levels we also need to ex- plore better sensemaking interface elements. The study was completed by crowd-workers, but ideally we conduct a similar study with actual MOOC learners. We need to explore the overhead of collaboration in the search as learning setting and design interfaces to decrease the costs of collaboration.